Nails are an essential in maintaining yourself with current beauty standards. Simply one toned nail paints are so out of league. 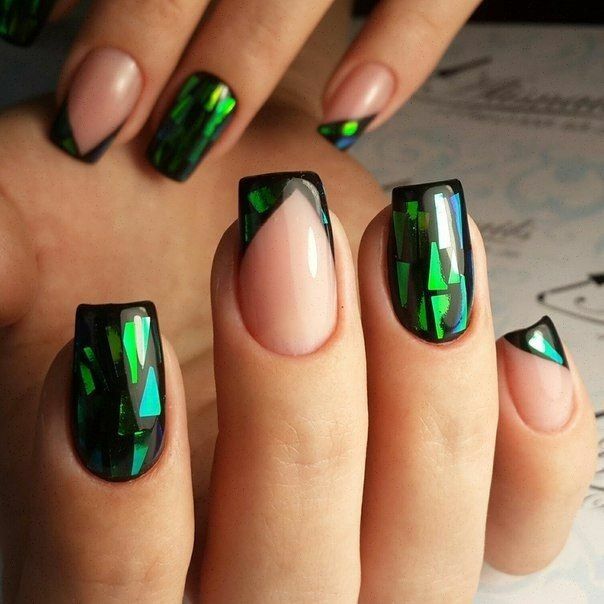 Girls now try to play around with colors and different other materials like sequins, pearls, nail tattoos, nail décor to create immensely beautiful, creative and cool nail art designs on their nails. One can simply mix and match different techniques to achieve the perfect nail look they have always thrived for. 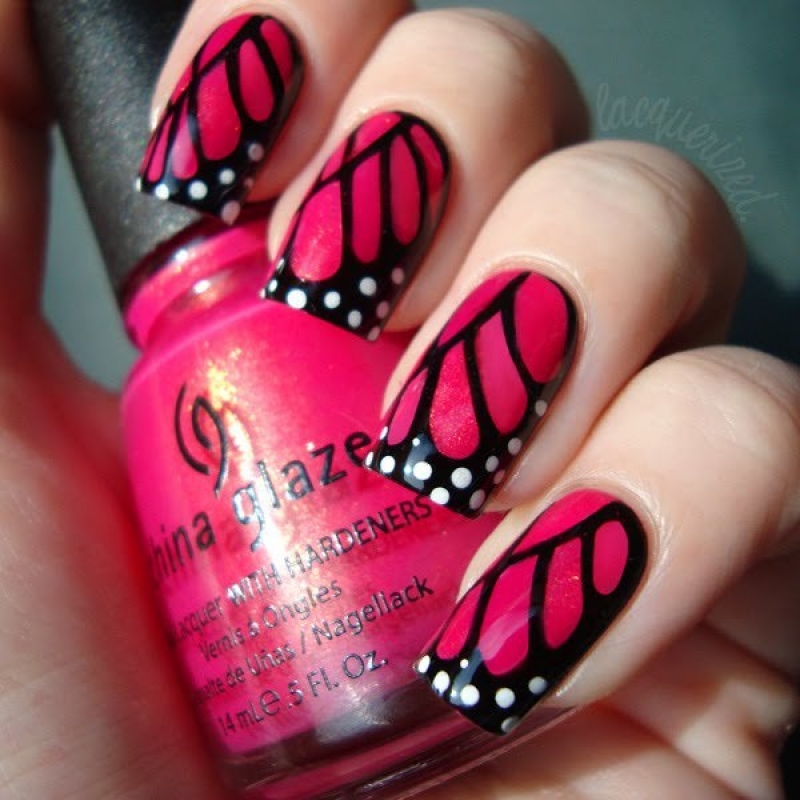 Following are some cool nail art design ideas that will help you achieve a classy, cool look with some simple steps. This look can be created by applying base coat of whatever color you want and adding a thin nail tape in middle and applying the other color, now you can add sequin of your choice and color to add more glam to your nails. This cool nail art design is really easy to do. You just need three colored nail polishes. Some bobby pins and tooth pick to create these polka dots and eyes of the bugs. This look is amazing and can be worn casually and formally both ways. Just applying the coat of your choice of color, add some glitter to sponge and gently rub on coat once dry. Finish off with top coat to complete the look. This design looks cool and funky. It’s simple and can be done by anyone. The plus of this design is you don’t need long nails for this. By applying simple base coats you can also use nail marker to draw buttons. Easy to do and still complimentary, this cool design can be used with almost every outfit and will make you coolest of all. All you have to do is apply a base coat and take a tooth pick or marker to draw dotted lines and some white paint to create the message plane. This one looks amazing and it’s most easy to do design. 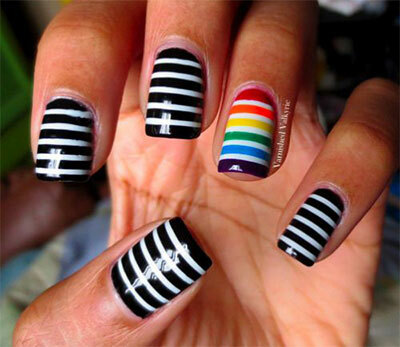 It can be applied with nail tapes and different colors of nail paints can be customized according to your choice. This design is coolest among teens. Very easy and can be done with precision. This look just involves some colors and bobby pins for dots and tooth pick to connect those dots, and ta da! This cool design will never be out of fashion. It’s the simplest thing to do with only two nail paints involving one black and other glittery glam. Simply, you can create galaxies on your nails. This cool gradient effect can be achieved by applying both shades of your choice. Remember to get best results you have to choose colors that are contrasting or complimenting each other. Apply one by one both shades on sponge and apply on to nails. Add glitter to one nail. And this cool look is done. This cool look can complement your Halloween look as well. All you have to do is to take a black matte nail paint and some white nail paint polka dots added on to them. This nail art may look complex but it’s not. 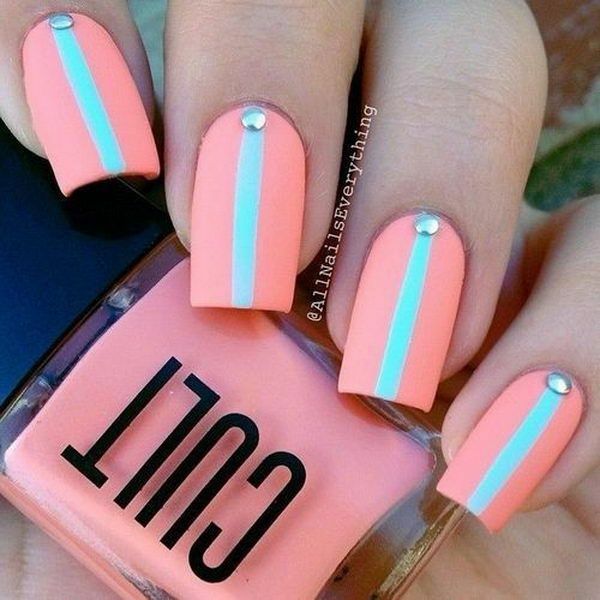 Apply a base coat and add nail tapes on it in a zigzag manner and add you second coat on top of it. This look is different and cool at a time. This cool nail art will never get old. Red is a hot favorite on nails for almost everyone. Applying and combining red with different hues of polka dots can create amazingly beautiful nails. Apply any dark matte nail paint and add your choice of color dots to create different patterns of dots on one finger nail. This will result in this classy and simple look. 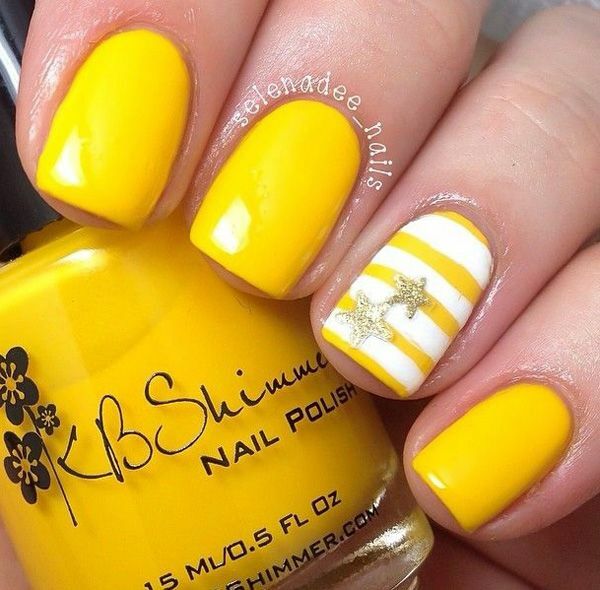 Add up a little glam with this pretty nail art design. Simply can be made by thin paint brushes and tooth pick can be used for polka dots. Simple French manicure can be paired with cute flowers to achieve this cool look. To add some glam on this look sequins and glitters can be added. 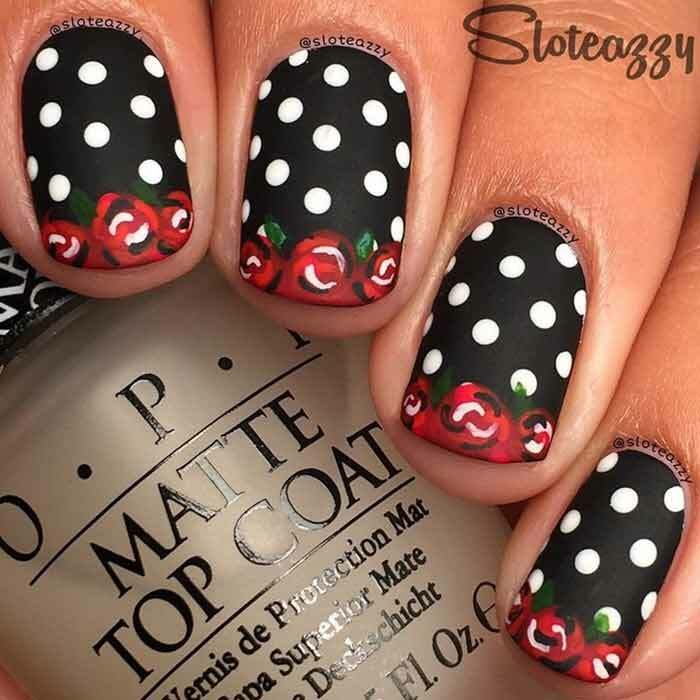 Adding a black matte nail paint, white polka dots and two different red hues can be used to create this beautiful piece of art on your nails. This look is simple to create but looks tricky and complex. This can stand out in a crowd. This design looks so cool and trendy. Its unimaginably easy. 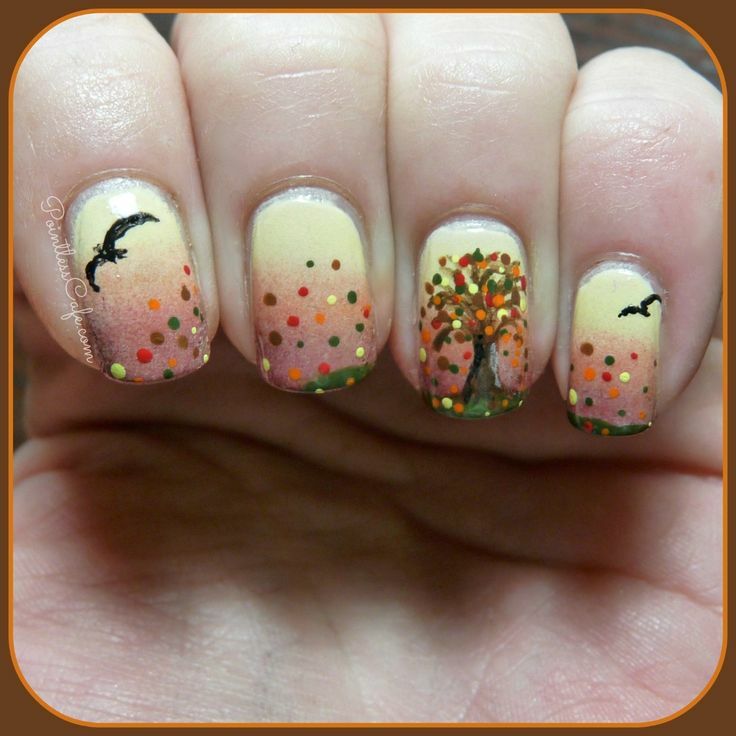 Use different colors of nail paint drops and by taking straw add these splatter on white nails. This is perfect for casual looks. Apply a base coat of white nail paint and slowly add different colors of nail paints on each nail. This look is simple easy cool and trendy. 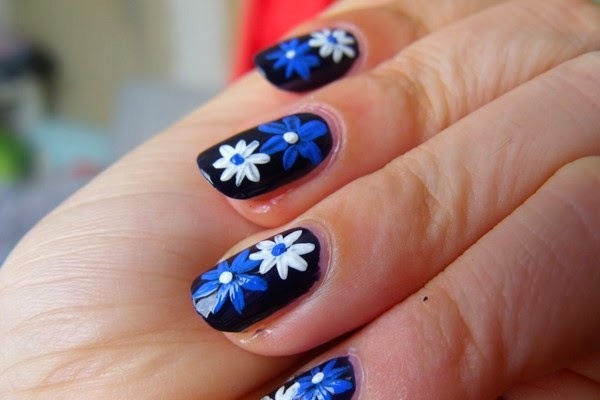 This look can be attained by applying black nail polish as a base and dark blue and white to create petals of daisy. Sequins or glitters can be added always to create a more glamorous look. This look can be easily attained by doing pink French tips and drawing a bow with brush or nail tape. This look can be customized also with different styles. 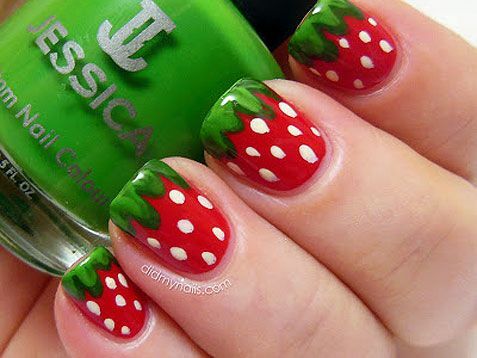 Fruits are easy to create on nails and they look refreshing as well. This trendy cool look can go with summer outfits very well. Simply using a thin brush and tooth pick this can be created. This look is a bit tricky but looks cool once you have mastered the art. It is only the game of color and shading, same and different colors are used to create shadows and 3d effect. Cool look for summers if done with light colors and can go along in winters also if some dark colors are used. You can use nail tape to take a margin of blocks. Two shades of colors always create magic when combined together. This look can be tailored according to dresses and glittery stars can be replaced by any shape you like or they can be polka dots as well. 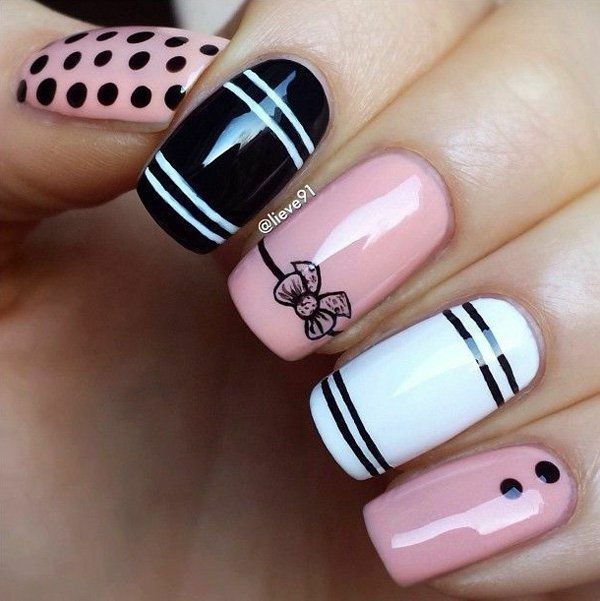 Different patterns on nails pair along with different outfits be it casual or formal. This type of look can be modified as well. Ideal look for date, anniversary, valentines or any special occasion with your partner. Easy to create look and will look classy. Polka dots at all times look cute on nails and if some glitter is added to one finger nail it will glam up the whole look. This look is easy as ABC, created by applying nail paints on to sponge first and then carefully transferring it to nails. Add some glitter to it and leave one finger nail to create a Disney villain character face, which makes this look bold. As the autumn season is arriving, this look can be created for Halloween, thanksgiving, or any evening event. You just need some glitter, some nail pens and different nail paints to play around to create this magical look.